Most people when they make a herbal tea from loose dried herbs are surprised by how much more flavour, aroma and beneficial effects they have than a prepackaged herbal teabag. The only downside is that it may take a few more seconds to make your tea. Here are 5 different options we recommend. 2. Use what you already have with a coffee press (caffitierre). This is a favourite, especially if making for lots of people. 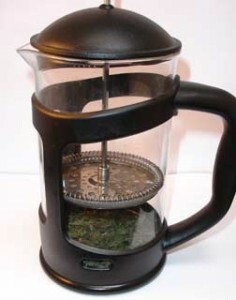 Use the caffiitere as if you were making coffee but use your loose herbs instead of ground coffee. Once finished you can pour off excess water and put the used herbs in the bin or compost. 3. 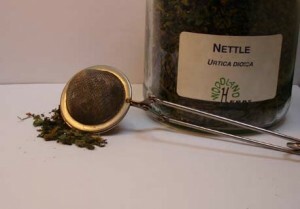 Get a really good filter by adding your herbs to an empty biodegradable tea bag . These gives a great filter and can be used to make one cup or a larger teapot. 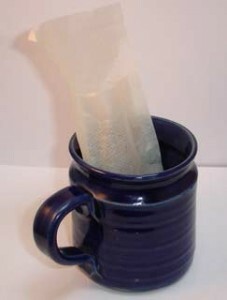 Our empty teabags can be filled and stood up in a cup or rolled over and held closed with a clip if being added to pot. 4. Go traditional with a teapot and tea strainer over your cup. A classic tea party option although some of the larger leaf dried herbs may be more difficult to pour. 5. Go with an in-cup filter. These vary in style and price but are very simple. Just add to the cup, place in the herbs you want and then add water. Once infused lift out the filter, dispose of the used herbs and rinse. They generally give a great filter and sometimes have a lid which can help keep in some of the beneficial phytonutrients in scented teas such as lavender or chamomile. Graham Swanson is the co-owner of Woodland Herbs a natural healthcare shop and clinic in Glasgow and has over a decade’s experience in natural healthcare. This article is for information only. Consider seeking medical advice if you are pregnant or breastfeeding, if you are already taking prescription medication or if your symptoms continue or worsen.